Horizon Yachts has announced an order for a new build E88 motor yacht. The 27.24 metre E88 yacht is the flagship of Horizon's contemporary E class, which combines a streamlined superstructure with a high-performance hull. Designed by John Lindblom, the E88 was created to satiate Horizon's client demand for a modern-looking yacht with classic lines. Already in build at Horizon, the new E88 has the Open Bridge configuration, but the yacht can also be had in a Skylounge version. The American client is a current Horizon Yachts owner who has chosen a four-stateroom layout for his E88, with separate crew quarters found aft. The owner will collaborate with Horizon's in-house design team to create the yacht to his exact brief. Notably, this is the fifth Horizon E88 to be sold in the US since May 2014. Horizon announced the sale of four E88 motor yachts in the US last summer, including three new build projects and one yacht built on speculation for the builder's inventory. The standard layout for the E88 has a spacious main saloon with a formal dining area forward and a country kitchen that's often favoured by American clientele. The latest E88 will feature zero speed stabilisers, an air-conditioned open bridge and a hi-low swim platform. She will boast a boosted power option with 1,900hp twin Caterpillar C32 engines. 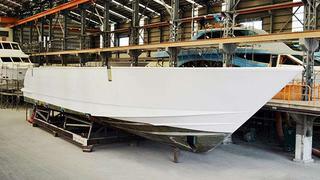 As the yacht is already under construction, the owner can expect a speedy delivery time with the launch scheduled for late summer 2015 and delivery to her owner in the US anticipated for this autumn.